Below the display lies the touch hub of the FiiO X1, primarily it starts with a huge click wheel, which supports both round motion and capacitive clicks. There are no physical buttons on the click wheel, rather that tag is given so that you could understand it better. Touch dial sounds accurate since it has been based upon capacitive touch technology. However, you can find a single button in the center which can be called as a switch to every other function to trigger. On the extreme corners of the touch dial, you can find four physical buttons, which have been located on four ends. These four buttons perform the function of Playback, Navigation and displaying Menu options. All in all the circular dial mechanism is quite easy to navigate, and one can get easily comfortable within few mins of usage. On a side note, the front screen guard makes you feel that the 2.0-inch glass display has an outer covering halfway through the front, but that's not the case. It just means that the screen guard layer is thick. Just below the touch dial, you can find a LED indicator, which has three colors - Red, blue and green. It changes depending on the occasion of varying battery levels. Flipping to the back, the entire back has been made out of aluminum. It has round edges on the sides which get plain towards bottom and top to maintain uniformity. There's also a Hi-Res audio sticker on the backside, which I feel represents the various driver support present on this audio player. 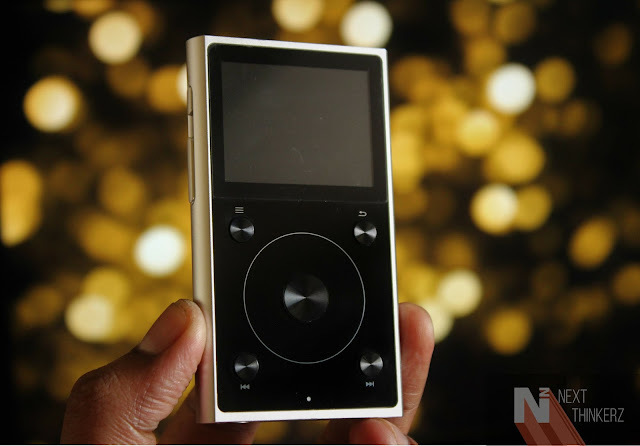 The FiiO X1 2nd Gen weighs around 102g and has the following dimensions - 97mm×55.5 mm. The weight gets mostly accompanied due to the aluminum built and 1800 mAh Li-Poly battery. However the overall built shoves that down, though mastering the art to turn up/down the volume might be a challenging task when you're using it single handed. Rest assured that the buttons provide a sufficient tactile feedback and don't feel mushy. Whereas all the input/output(Headphone Jack, Line out jack, Micro-USB port & MicroSD card slot) ports can get found on the bottom of the FiiO X1 2nd Gen audio player. The output from the FiiO X1 2nd Gen is quite satisfying, and it's well up to the mark. I tested it with FLAC files, and the output I received from the same was quite good; however, some level of distortion got observed when I plugged in my wired earphones. I have a plethora of earphones on which I tried the same, as I thought that it might be particular headset issue. However, this distortion is on a low level and only gets observed when you increase the volume. The same can change if you use a proper Hi-Res Supported earphone. Though when wireless headsets get utilized, the plot takes a twist. The output on my BLU-200 earphones was top notch, and I enjoyed listening to music on the same. The FiiO X1 2nd Gen comes with Texas Instruments CM5242 DAC chip which has a Texas Instruments OPA2322 low noise amplifier, & an Intersil ISL28291 amplifier. Both of these amplifiers help in providing a balanced output and end up in providing a prolonged battery usage. It also supports something called "Deep Sleep Mode," where the X1 stays in sleep mode for up to 15 days without usage. Yes, the company's statement stands valid, since I did get that exact backup when I kept it inside my bag for nearly two weeks, while it was up and ready to give me roughly about 2 hrs of audio backup which was impressive. On an average, it gave me about a full day of battery backup, when used regularly. Progressively I like the balanced output, and well soundstage I heard from the FiiO X1 2nd Gen player. But all of that experience was observed via my Bluetooth Earphones, and sadly the output gets compressed since it doesn't support AptX codec. I wasn't going to put this here since I was not sure about the AptX audio output, but after testing it via my OnePlus 5, Boy I'm a fan of this AptX codec platform. On the flipside, it comes with Bluetooth 4.0 onboard, but I experienced range issues on the same. The audio starts to stutter even from the head to pocket distant, whereas I'm not any 7ft tall. So that can be a disappointment as the upgrade from FiiO X1 Gen 1 to Gen 2 provides original portable features, however with significant shortcomings. Still, I'm glad that the audio works fine in proper range conditions, just make sure you have got a pocket in your T-shirt. Though due to the lack of the amp cable, I didn't try the amplifier Line-out port. However, I suppose that would be good according to few videos on YouTube. Another thing which I forgot to mention is that the MicroSD card slot supports up to 256GB of expansion, as it only comes with 8GB onboard. The audio player supports ExFAT32 and FAT32 cards. Speaking of which subscribe to our channel, we'll soon upload an unboxing of the same. The 2nd Gen FiiO X1 runs on Linux based OS which is quite faster than the UCOS used on 1st Gen platform. The new interface has three inbuilt themes which just changes the color of the display and few icons. 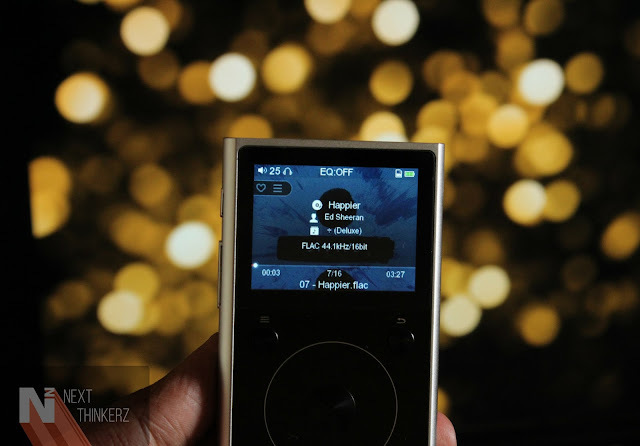 Everything feels old school, probably how a retro music player should feel. Everything is simple - touch, scroll and select. However, it would've been great if any software updates could be provided for the same to enhance overtime, practically speaking it's impossible therefore I won't emphasize on that. Talking about the box accessories, you get - a Micro-USB cable, two different carbon fiber skins which fit across the body, two screen guards, a hard shell silicone body case, Quick Start guide & a warranty card. FiiO X1 2nd Gen Review - should you buy it? 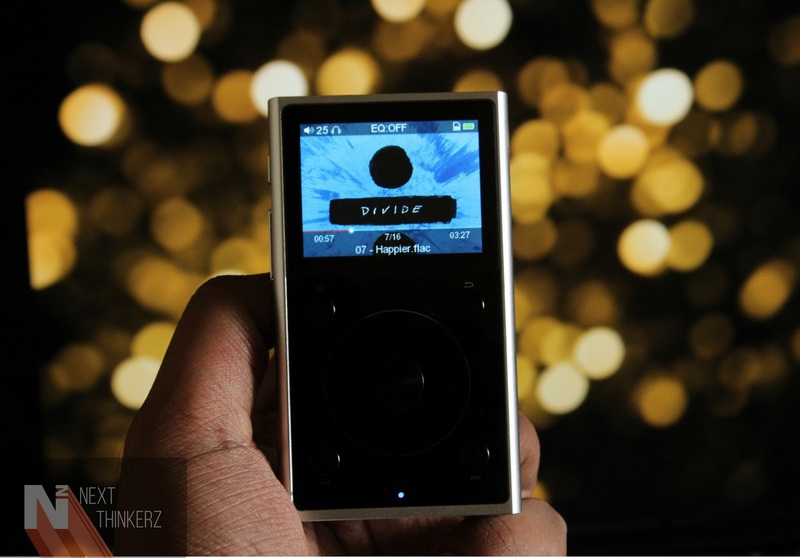 The FiiO X1 2nd Gen is an interesting gadget which will grab the attention of any audiophile as it offers a lot in a small package. 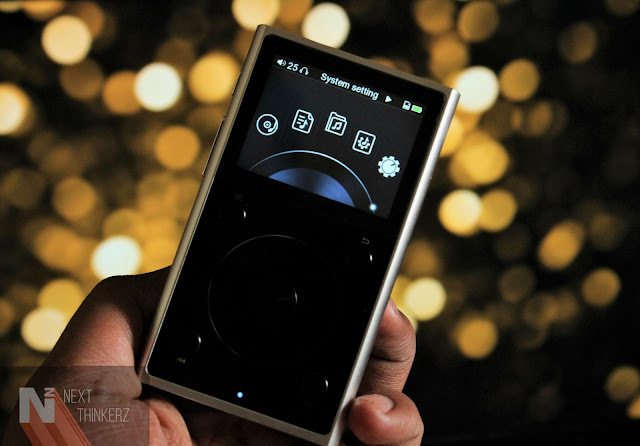 The capacitive touch dial, Bluetooth 4.0 & a high quality dedicated DAC chip could complete few phrases to describe it. Supporting almost five lossless formats such as APE/FLAC/WAV/WMA/ALAC files. On top of that, a 2.0 inch TFT color display with Linux based OS is quite some experience. However you can notice pixels even from the far end, but do you need such kind of precision inside a music player? But another thing which one might worry is why does one require such kind of device in 2017? Well, you might be afraid of using your expensive phone at your GYM, who's to the rescue with decent sound quality? Heading to travel somewhere? Don't want to indulge into any social media notifications immediately? Well, the FiiO X1 is here. 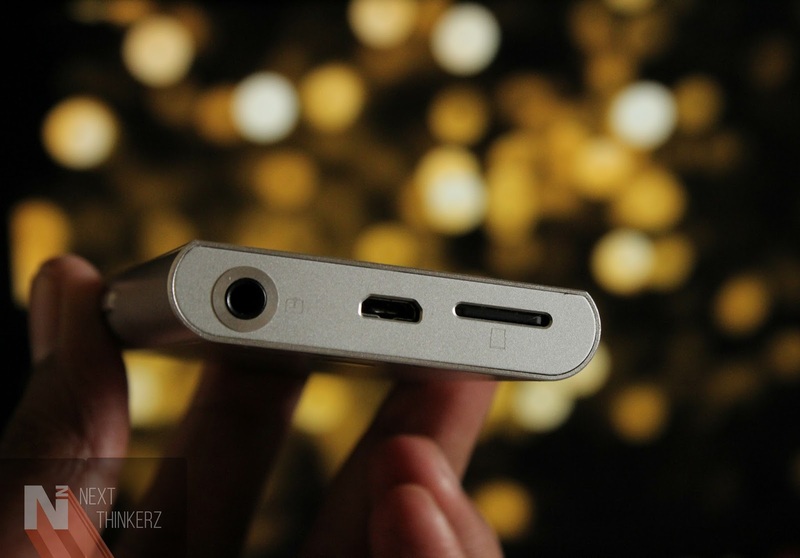 This audio gadget can undoubtedly increase the hassle of charging it separately but look at the flipside. You can enjoy music without thinking or be indulging in your social/virtual world. Think about it. 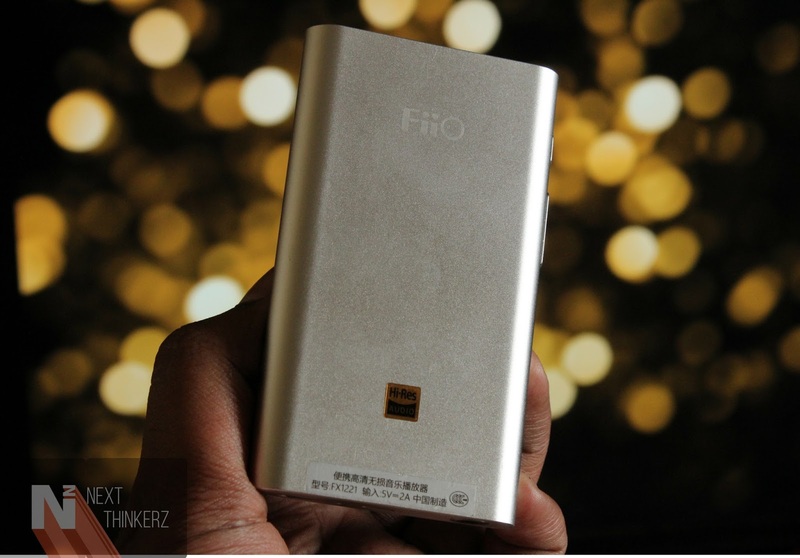 But did I concluded that you should buy FiiO X1 2nd Gen? Certainly not. This gadget is essential to a certain point, audio is decent via wireless earphones but again loses in this dept due to range issues. Wired earphone output is good only if you use Hi-Res Audio Supported Headset/Earphones. Not everyone is fond of carrying such things, besides the fact that they're expensive. But again if your day includes even 10% of workout, while you consider keeping your phone at home, then FiiO X1 2nd Gen might certainly be a good choice. It is priced at Rs.7499 and is available official only via FiiO India store. However, you can find it listed on Amazon India. I feel that for such a price it seems like a steal! However, you might not require such a gadget after a particular span of time.